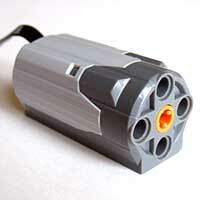 We use two primary types of LEGO electric motors in our programs. Some of our instructors use the 9V system introduced by LEGO in 1997. (pictured on the right). 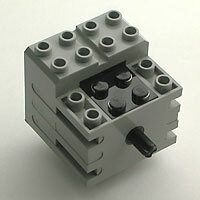 LEGO has discontinued the manufacture and sale of these motors and their associated battery boxes and connection systems (leads). It may still be possible to find limited quantities of these components through Bricklink (an online LEGO parts marketplace) and other sellers, but finding these items is increasingly difficult. We continue to use our existing supplies of these parts because of their high quality, reliability and ease of use. Other instructors use the Power Functions system introduced by LEGO in 2007. These motors also use a 9 volt power supply, but the connection system for the Power Function system is completely different from that used in the older 9V system. Some of our instructors have adapter cables that allow the battery boxes designed for the Power Functions system to be used with the older style motors (as well as allowing the 9V system battery boxes to be used with the Power Functions motors). The Power Functions system includes the M motor (pictured on the left), along with the higher torque and higher speed XL motor. The system also various battery box options and a infrared remote control unit. A wide array of Power Functions components is available from Lego Shop at Home, and a more limited selection of components is available from LEGO Education. Although the form factor for the Power Functions motors differs from that of the 9V system, it most cases it is not that difficult to adapt creation designed for one motor system to use the other system. Many excellent resources are available with building instructions using both types of motors. Among the books we recommend are The LEGO Technic Idea Book (Volume 1: Simple Machines, Volume 2: Fantastic Contraptions, Volume 3: Wheeled Wonders ) and The Unofficial LEGO Technic Builder's Guide. Our Marin Activity Center features a parts store with hundreds of different LEGO parts. The parts store is open during Play-Well Marin's regular business hours.